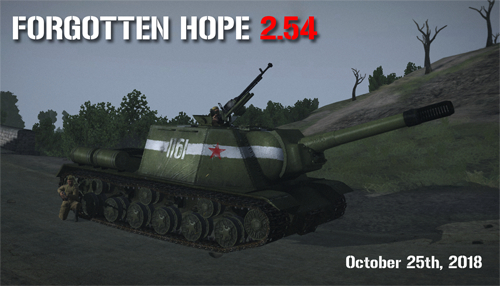 We are pleased to announce that Forgotten Hope 2.54 is now live! You can download it by starting the Launcher. New and returning players can download the launcher from our downloads page. We hope to see you on the battlefield! That's all for today, but be sure to come back next time for another update. Until then, feel free to visit our Discord, our public forums, and/or our Twitter and Facebook pages to discuss this update and other news. Today we are listing out some of the changes made in 2.54, but before we get to that we have the link to the files needed by server administrators to get their servers set up and running in time for the release. You can find these files here. You do not need to download these files unless you administer a server. The files required to play 2.54 will be available through the Launcher. The two ISUs shown so far will be replacing a number of instances of the SU-152 throughout the mod, principally on the later maps to reflect the changing usage as production switched to the newer vehicles. In addition to this, the new HD fonts shown previously have also been updated to include the console and nametag text. However, the main reason for this update was to allow the inclusion of proper characters for other languages. Starting with version 2.54, both Russian and Swedish are now supported, and we hope to add more in the future. You can change your game's language via the launcher, simply enter the Options page and find the selector on the Gameplay tab. The aerial objective mode on Ihantala 32 has been replaced with a more conventional push mode layout, and some balance changes have been made to its 64 layer too. Balance changes have also been made to Lenino 64 and Ogledow 64, and singleplayer support has been added to Lenino and Studienka. The final change is the addition of new player animations for most of our stationary machineguns by the talented McCloskey. 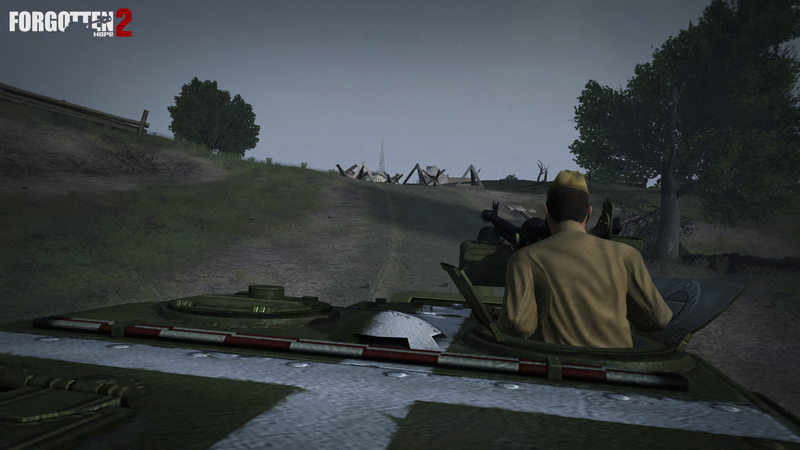 He has also provided custom animations for the DShK mounting on the ISU-152. That's all for today, but be sure to come back Thursday for the release. Until then, feel free to visit our Discord, our public forums, and/or our Twitter and Facebook pages to discuss this update and other news. The ISU-122 was a logical modification to the ISU-152. The latter's ML-20S howitzer had had its original carriage used for the A-19 field gun, and this similarity was shared by the ISU mounting. While a prototype had been completed in December of 1943, production of the ISU-122 didn't start until March, when the production of hulls had started to outstrip the production of howitzers. The ISU-122 was used similarly to ISU-152 as an infantry support vehicle, but its greater accuracy soon found it a role as a formidable tank killer. Despite the lighter ammunition, the ISU-122 did not manage a greater rate of fire over its larger armed brother, primarily due to the antiquated design of the breech of the A-19S. An improved version of this gun that solved this issue, the D-25S, was added along with a redesigned mantlet to make the ISU-122S, but large stocks of the older gun meant that both designs remained in production for the rest of the war. The ISU-122 did not have the same kind of post-war longevity as the ISU-152, serving until only the start of the 1960s and not receiving as extensive modifications. 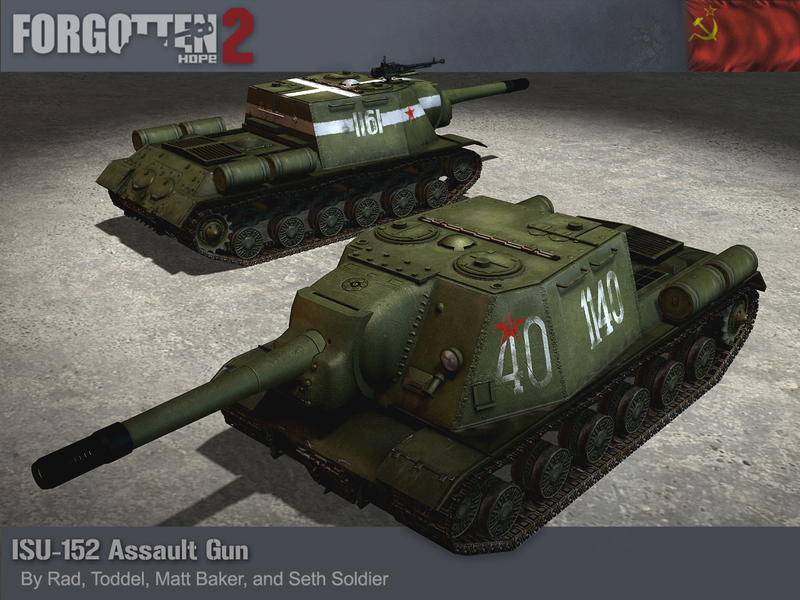 In total, 1150 ISU-122s were built, and ours was made by Seth Soldier, who modified our IS-2 made originally by Rad, Toddel and Matt Baker. That's all for today, but be sure to come back tomorrow for another update. Until then, feel free to visit our Discord, our public forums, and/or our Twitter and Facebook pages to discuss this update and other news. As usual, we'd like to give a big thanks to our players for sticking with us and keeping the servers populated even after all this time. Additionally, we would like to thank our team of betatesters for their dedication to improving our work, as well as our developers for the time and effort they put in to make things happen. Last but not least, none of this would be possible without the web hosting generously provided by Fluestertuete. 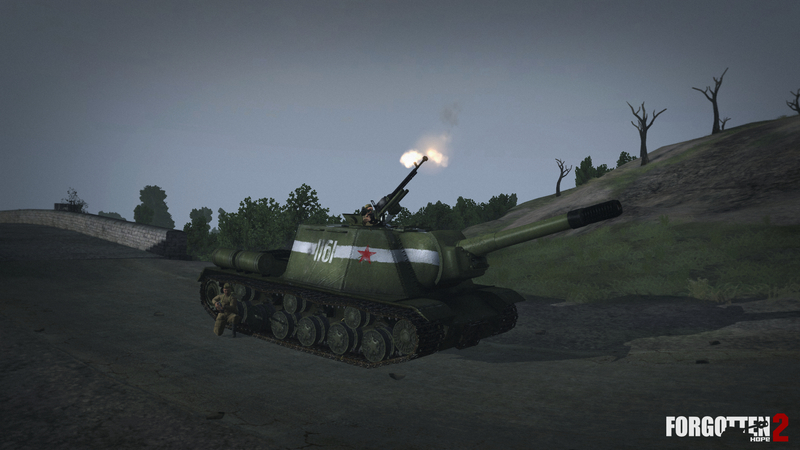 The SU-152 had proven itself as a valuable asset to the Red Army from it's introduction in early 1943. However, by the middle of the year it was recognised that the design would need to be adapted, as the KV-1S chassis that it was built on was being replaced in production by the new IS series. The new ISU-152 replaced the older design in production by December of the same year. Just like it's predecessor, the ISU-152 was primarliy tasked with supporting the infantry in assaults against hardened targets. As such, it was primarily issued with high explosive shells for its 152mm howitzer. While an armour piercing round was developed, these were rare and only slightly more effective against tanks than the blast of the HE shell. The ISU-152 went through several upgrades during and after the war. One of these was the addition of a 12.7mm DShK machinegun on an anti-aircraft mount. 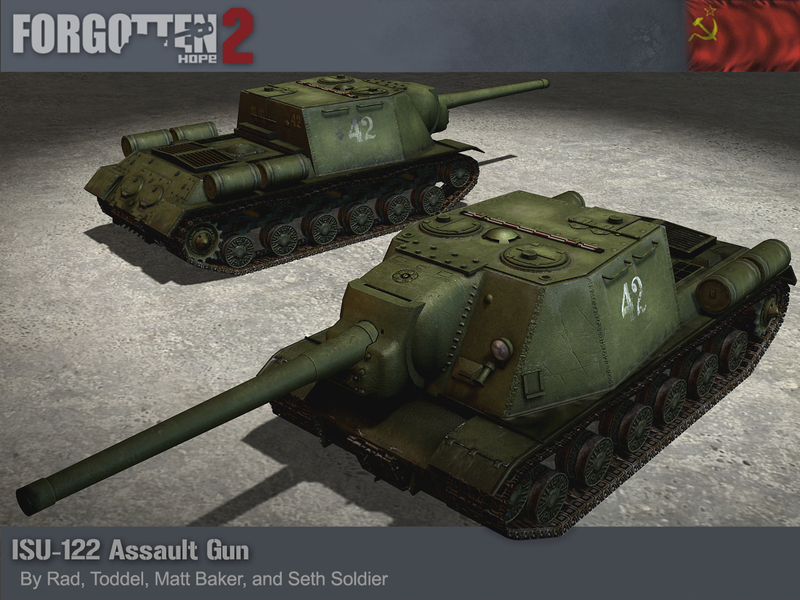 In total, 1885 ISU-152s were built during the war (a further 1357 followed after the war and served into the 1970s), and ours was made by Seth Soldier, who modified our IS-2 made originally by Rad, Toddel and Matt Baker. Originally developed in the late 1920's by Vasily Degtyaryov as the magazine fed DK, the weapon was updated in 1938 with an add-on belt feed by Georgi Shpagin to become the DShK. Conceived of as a light anti-tank and anti-aircraft weapon, it would primarily fall into the role of the latter, either tripod mounted, or fixed to the hatch of an IS or ISU. Ours was made by Seth Soldier.